Frozen pipes are an issue that few Florida home and business owners think about — that is until the air fills with frost and drips below freezing in the heart of winter. If you’re unprepared for dealing with frozen pipes, have no fear. Our plumbing repair company provides all-encompassing plumbing and piping services to in your commercial or residential properties in North Central Florida. Our team is ready to unthaw any frozen pipes and return your home or business to normal, day or night. We have the skill set, experience, and up-to-date technology required to efficiently and effectively handle any plumbing issue that develops — contact Sunshine Plumbing and Gas! Which Types Of Above-Ground Pipes Are Prone To Freezing? Many above-ground pipes are uninsulated or located in parts of the home or business with little insulation. Exterior walls in Florida have less insulation due to our mild climate, exposing pipes in these walls to freezing if the temperature stays below 32 degrees Fahrenheit. Many homes in our area have a lawn irrigation system, including sprinklers. Unfortunately, these systems are prone to freezing during cold weather if not prepared before the mercury drops. Unless the system is used during the winter, turn off the water supply to it and ensure the main shut-off valve is insulated. An Ocala plumber will advise that any above ground piping for the system should be insulated, such as with self-sticking, foam-insulating tape. Since we rarely experience long-period cold in North Central Florida, one area in the home that’s overlooked for proper insulation is water lines to washing machines. Laundry rooms are near the edge of homes and have limited heat from the home’s HVAC system and vents. Major home improvement stores have insulation specifically for washer hookups that is easy to install yourself. It’s also recommended to turn off the water supply to a washing machine if you’ll be gone for any length of time, such as for a winter vacation. Outside plumbing is a common area in which frozen pipes can occur. Outside pipes should be drained and insulated, if not turned off, before winter if they won’t be used during colder months. Remember to detach any outdoor hoses, like garden hoses, from the outdoor faucet. A frozen water hose increases the overall pressure in the outdoor plumbing and the potential for the pipe to burst and flood. Use an insulating dome or other covering on outdoor faucets and spigots. Are Exposed Pipes Prone To Freezing? It’s not unusual to find exposed pipes throughout Florida homes and businesses. Because slab foundations are common, pipes run through the attic instead. Water pipes snake through unheated parts of the building and with inadequate insulation, making them prone to freezing. One way to remedy this situation is by using flexible foam pipe insulation. It’s made from rubber, easily fits over an exposed pipe, and can be found at your local home improvement stores. How Can I Prevent Frozen Pipes In Florida? It may seem like a good idea to adjust the thermostat as you come and go in your home or business, but it’s better to leave the temperature at a consistent number. If you’re leaving for several days, set the thermostat no lower than 55 degrees in your home or business. 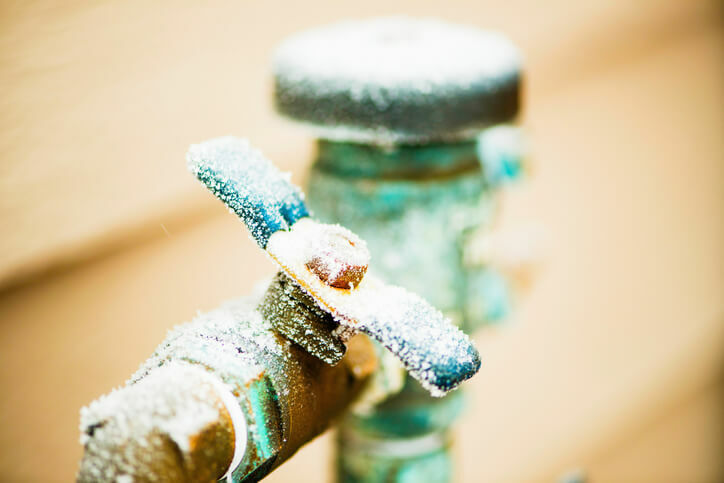 Other ways to prevent your residential plumbing and commercial plumbing system from freezing include the following. Turn a faucet on to a tiny stream, generally less than a pencil width, to keep the water flowing inside the pipes. The best way to ensure your North Central Florida property is ready to handle extreme cold is with a professional inspection and repair services. We will inspect every part of your plumbing system to ensure every pipe is properly insulated and all air leaks are repaired. Leave cabinet doors to sinks open so warm air can reach inside, especially if the sink is on an outside wall. Check your home or business for air leaks, such as around windows. Taking the time to seal air leaks as soon as they’re found is an easy way to prevent frozen pipes.